The Beautiful Blogger and Blogger Recognition Awards! I am posting two different awards in the same post, I am so dangerous and rebellious, I know 😉 . The first award I received, The Blogger Recognition Award, was from IHeartFictionalPeople . The second award, The Beautiful Blogger Award, I received from IWillNeverOwnEnoughBooks . Thank you both so much for the kind words and for choosing me 🙂 So what I am going to do is post the rules for each of the Awards and do a little bit of each, the bloggers I choose can pick either award or do both…do whatever your heart desires! 1. Select 15 other blogs to give the award to. You might have to do some searching, but you can find those blogs. You can’t nominate yourself or the person who nominated you. 2. Make a post to show off your award! Talk about how your blog got started and give some advice to the other bloggers out there. And share the fancy picture! 3. Comment on each blog to let the blogger know that you have nominated them. 4. Link to the original post at Edge of Night; that way, anyone can find the original guidelines and such. Tell those lucky people that you’ve done this and give ’em the rules. In May of this year I started this blog, my first and so far only. I had really never thought of myself as the blogging type, especially since I had no idea what I would blog about. In high school I was always so busy with sports (swim practice before school, school, high school soccer practice, and then traveling team soccer practice) that I barely had time to sleep. But one constant that I have always had since elementary school was that I was always reading. So now, six years out of high school, I am working like crazy and was trying to find a hobby for myself that didn’t involve typical young adult craziness (bars and partying). The obvious answer was book reviewing because nothing gets better than free copies of books! But quite quickly it turned into a yearning to help authors get more recognized, and to show other bloggers and readers their amazing work. I love giving authors feedback on their work and hearing how grateful they are to have bloggers like us around! A few years ago I went to a Killswitch Engage concert in San Francisco, crowd surfed to the front of the stage, and was thrown on stage with the band. They let me run around the stage causing mayhem for about two songs, gotta love them! I want to live in a house with huge windows, plants everywhere, and in the middle of nowhere. That is all. About three years ago I had neon pink hair that was so amazing that it glowed under a black light. It literally looked as if a glow stick had exploded all over my long wavy hair, it was fantastic! Now I have my natural colored hair back but it is shaved underneath. I have a seriously terrible obsession with blankets. Heavy blankets, soft blankets, small blankets, large blankets, quilts, comforters, throws…it doesn’t matter. There is about thirteen blankets currently on my bed, and they are perfectly layered in order by my favoritism of them and the feel. Which brings me to number 6. I have OCD for cleaning and organizing my things. For example: The blankets on my bed have to be spread out in a certain order, and nobody in my house is allowed to touch anything in the kitchen. Granted, I do get tired of cooking for everyone and doing all of the dishes…but at least I know everything was put back in its place and was cleaned correctly. Haha…I sound crazy lol. In my junior year of high school I was put into a creative writing class because that was the only elective that was left for me to take. I have always been great in English classes, but I had never done any creative writing up until that point. This class, and the teacher, turned out to be my FAVORITE and it left a HUGE impression on me. I’m pale too! The sun is so gross… Seattle is my dream place to live, but my husband hates it, granted neither of us have been, but he has compromised with us one day living in Portland, Oregon. I just need rain… and books. I am thinking about Colorado, I think snow will suffice for me lol. Rain, books, and blankets…heaven! 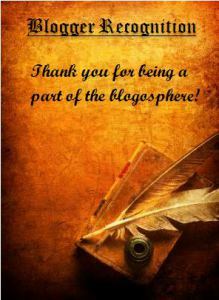 Congratulations on the awards and I’m pleased you are following my blog. I’ll look forward to more of yours. I’m with you on 1 and 3. My dream is to move to canada and live in the middle of nowhere! No one to hear you having a wizard duel with yourself or to ask you stupid question like, what are you doing? Or is that just me?